Summary: The pictogram informs about the destruction of Earth civilization in global cataclysms due to the wrong decision - not to unite consciousness for the Transition to the next cycle of life. The pictogram transmits a great despair of extraterrestrial civilizations (ETC). Many thousands of years ETC are struggling for saving young germ of consciousness in the Solar system, Milky Way galaxy. Despair ETC is based on misunderstanding of Earth civilization danger of global cataclysms beginning in the nearest future, as an unmanaged process. On the way to share this information to people of Earth aroused insurmountable obstacles. They block the interest to transmitted information by creating hoaxes. Nevertheless, we are inevitably approaching the moment of the beginning of global cataclysms. It is necessary to call the Governments about banning hoaxes of crop circles. Crop circles are the only source for ETC instructions necessary for continuation of our civilization life. Crop circles are the property of all mankind. Cataclysms will never stop and will become stronger because it is the process of planet destruction. ETC instructions confirm that for continuation of our civilization life we must make the Transition to the next cycle. This can be done only through the unified consciousness. ETC argued that remaining in the mode of individual consciousness humanity will perish in global cataclysms. The Transition opens for us great possibilities of future and will not affect nobody’ private properties. In the center of the pictogram is shown the individual cell (Fig. 1.1). It contains a small area of brain, placed in the center of the circle and the border – the largest circle. On this largest circle light and dark circles with different diameters are placed. Laying of grass in the central circle represents two beaks of the hysteresis loop (Fig. 1.2) – symbols of the magnetic field. Crop circle with analog symbolic appeared in Italy (Fig. 1.3). This styling is very different from other circles (Fig. 1.4). It shows a mortal danger to the life of every resident on the planet. The risk associated with the start of a global cataclysm in connection with the critical weakening of Earth magnetic field. The same image of two beaks of hysteresis loops – magnetic field symbols – show two halves of crop circle’ center (Figure 1.5). Near the central circle of bigger diameter on one line two same circles of smaller diameter are represented (fig. 1.7). They show expansion of a brain area under the united consciousnesses formation (fig. 1.6). From the central circle in both sides are located three circles of smaller diameter (fig. 1.8). Four circles together with the central circle from one and other sides, underline the fourth level of human being individual consciousness. On the other hand, two uniting cells – consciousness of two people are shown. Three circles of smaller diameter including in this group, represent three previous levels of consciousness in a cell of human being. On the left side of the picture (Fig. 1.8) are shown increasing circles placed on the circumference. They represent the evolution of nature till achieving the fourth level of consciousness of human being. Such circles are 10. This number underlines the five-fold unification of two cells. Number 5 represents the fifth highest level of consciousness – the united. On the right part of the pictogram are going down transparent circles of decreasing diameter by the circumference (Fig. 1.8). They tell us that humanity has a choice – the individual consciousness or united. It shows the first circle with two concentric circles (Fig. 1.9). Small circle in the center represents the brain area of individual cells. Concentric circles present the expansion of brain area under united consciousness. Our choice is individual consciousness. This choice shows next second transparent circle with two dots – brain areas of two individual cells (Fig. 1.10). Moreover, the dividing strip in this circle shows that these two cells - two people – are strictly individual and each of them has his own interest. Nevertheless, through this element ETC show that it is still the possibility of consciousness unification. A brain area of the united cell is shown by inner circle. However, further development of pathologically deformed mind of mankind, which ETC represent in other crop circles, completely eliminates this possibility. This information tells the next circle (Figure 1.11). It shows that individual consciousness of each human being strengthens. This process ETC depict by expansion of brain areas and body areas of two cells, which completely occupy the entire space of the circle. In this case, two individual cells are still separated by a line. Therefore, in our civilization, everyone increasingly protects his interests and is totally not interested in others. We even do not think about consciousness unification. The next three circles (Fig. 1.12) with the dividing strip are gradually reduced. This shows the weakening of the possibility of human decision-making to unite consciousness for the Transition to the next cycle of life. It means that there would be various reasons that will no longer allow separated consciousness of humanity to unite. Among these reasons are the following: shock and despair, caused by incredible power of the first pre-cataclysm and huge losses in it. Suicides, violation of human communication: telephone, Internet and others. All this would lead to sad results. Separated by first pre-cataclysm people will not have time to unite consciousness before the beginning of second pre-cataclysm. The group of four circles (Fig. 1.12) with the dividing strips underlines the fourth level of consciousness, which was chosen by mankind – the individual consciousness. The result of not accepted decision of consciousness unification is shown by winding line which finishes this pictogram of warning (Fig. 1.13). This line is attached to the fourth smallest circle with a dividing strip. The line ends with a shapeless figure, consisting of two elements, one of which is more than another (Fig. 1.13). It shows never made transition from the individual consciousness to the united. The pictogram is finished by a small dark circle, which depicts a brain area of individual cell (Fig. 1.13). This is the reason of all Earth civilization destruction, which was not able to unite consciousness for the Transition to the next cycle of life. Thus, the pictogram shows that the individual consciousness leads mankind to destruction. No wonder that the main principle of the modern development of human consciousness is: Love your neighbor as yourself. This principle is the preparation for the unification of humanity consciousness. 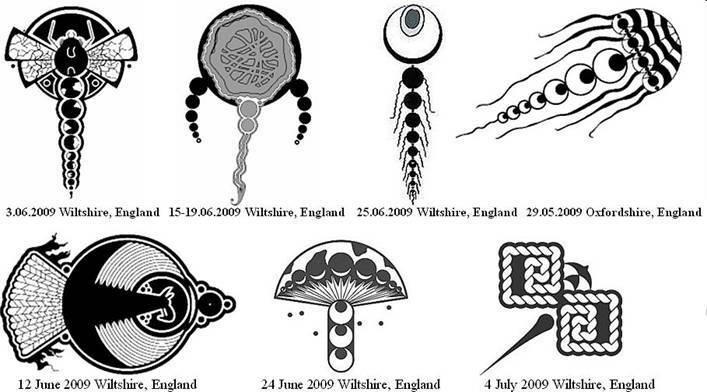 The same information but very briefly transmits the pictogram which arises on the 31st of May, 2010 in Wiltshire, England. The central circle represents a combined cell – individual and united consciousness. This combined cell of human being represents choice of our life principle: individual or united consciousness. The winding line confirms that this choice is vitally serious because it is choice between life and destruction of Earth civilization. Events on Earth: wars, acts of terrorism, huge number of suicides, etc. show that our consciousness is strictly individual. In this case ETC present our nearest future – destruction of Earth civilization. This information about the possible destruction of Earth civilization if we will not be able to unite consciousness, ETC transmit repeatedly, each time adding more details. Especially many of these messages appeared in 2009 in England, which are presented in some examples. 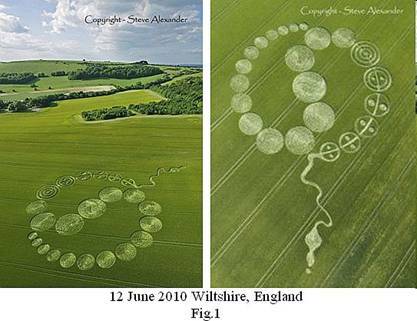 ETC in crop circle appeared on July, 28-31st 2004 in Wiltshire, England have presented the beautiful Program of consciousness development of Earth civilization (Fig. 2). The pictogram tells about improbably far future of mankind. ETC inform that after completing of consciousness development in Solar system mankind will continue life already in other planetary system consisting of six planets and other star, not our Sun. After completing consciousness development in this new planetary system we will live on each of five single planets. This Program is shown by the central line of crop circle 28-31 July 2004 Wiltshire, England by eleven circles. Six big circles, united by thin line, represent planetary system and five separate small circles present single planets. Crop circle informs that in a new planetary system mankind will possess not individual consciousness, but united. Therefore mankind will already fly in the universe, studying other forms of life. The pictogram of 2009 informs that today we are looking for different future, which corresponds to the individual consciousness and destruction. Our beautiful future, which ETC presented earlier in 2004, will happen, if we made the Transition into the next cycle of life through the united consciousness before the beginning of global cataclysms. 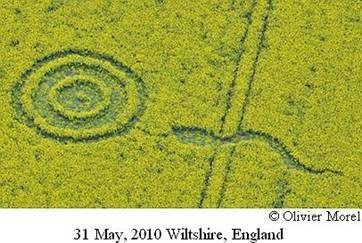 So, later, in another crop circle – 15-19 June 2009 Wiltshire England – ETC have shown our future by destruction symbols. Today our future shows the twisting line ending the central line of the 2009 crop circle. It means not only destruction of Earth civilization, but also of all three previous levels of consciousness entering into our information cell corresponding to inorganic and organic nature. This information is presented by three light strips entering into a twisting line. The cause of civilization destruction is shown by a small circle in the end of a twisting line. It is a brain area of an individual cell. Both of these crop circles depicting the Program of mankind development were built in several stages. In the first crop circle in 2004 it was due to the complexity of the composition. As a result the subsequent parts of the information were overlapped on previous and completely closed it. Crop circle of 2009 is simpler. Several stages of its construction were done on purpose to emphasize the analogy with the stages of constructing the crop circle 2004. This indicates that these two images is uniform information on possible options for program development of human consciousness. ETC do not want star wars as we consider due to our aggressive consciousness. ETC mission is unification of the universe consciousness. The universe - is a uniform system of consciousness. The Solar system - is one of long lines of consciousness Milky Way galaxy. The destruction of mankind in the global cataclysms means breakage the line of consciousness in Solar system. It's like micro stroke in this part of universe, and will be reflected in ETC destiny too. Our Transition according to ETC instructions will be the great triumph of ETC multi-millennial struggle for continuation of consciousness development in Solar system and in Milky Way galaxy.